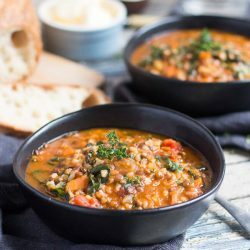 A really simple lentil and brown rice soup recipe that is very easy to whip up, and makes a deliciously hearty meal for a cold winter’s night. Gluten free and dairy free, it can easily be turned into a vegetarian meal to suit every one in the family. Melt the ghee in a large saucepan ( at least 2L capacity) over a medium heat. Add the sliced onion to the pot, and saute for 5 minutes or until the onion has softened and is starting to colour. Stir in the chopped bacon and cook for a further 3 minutes, or until the fat starts to run and the bacon begins to colour. Add the carrot, celery and garlic, and saute for a further 2 minutes, or until you can smell the garlic aroma rising from the pot. Pour in the chopped tomatoes, chicken stock, rice, lentils and herbs. Season with black pepper but DO NOT add salt at this point. Lower the heat under the pot to medium - low and simmer for approximately 40 minutes, or until the rice and lentils are tender. Add the shredded silverbeet to the soup and simmer for a further 3 minutes, or until the greens have wilted and softened. Season the soup with salt, and an extra grating of pepper. Make this soup into a vegetarian meal by substituting vegetable stock for the chicken stock and omitting the bacon. This soup freezes well, but may thicken a bit on cooling. Just add additional water when you are reheating to thin it out. The lentils are cooked when they can be easily squished between your fingers. There should be no hard or gritty pieces in the cooked lentil. If there is just cook them a little longer and squish again. Use whatever greens on hand in the soup. Silver beet, spinach, kale, mustard greens and even finely shredded Asian greens all work well here. Serve the soup with crusty bread for a delicious hearty winter meal.